1. Slice one Rice Krispies Treat into 6 thin lengthwise slices. 2. Decapitate 6 Peeps of your color choice. In other words, cut off the heads (but try to keep a little of the neck—you will see why later). 3. Portion out a length of Fruit by the Foot into smaller sections slightly longer than the Rice Krispies Treat slice. 4. Flatten and elongate the Rice Krispies Treat slice slightly and shape it into a hollow circle. It’s okay if it breaks; just mold it back together again. 5. Take a Peep head and tuck it into the top of the hollow Rice Krisipies Treat cylinder. Use a toothpick or the tip of a knife to help it get snug. 6. Wrap the Fruit by the Foot strip around your roll. Some folding and nipping may be necessary to get the cleanest look. Oh goodness, this is incredibly awesome. I love! Oh my goodness....this is so awesome. I think I'll blog you if that is okay? Candidly I don't like peeps but this looks really good! 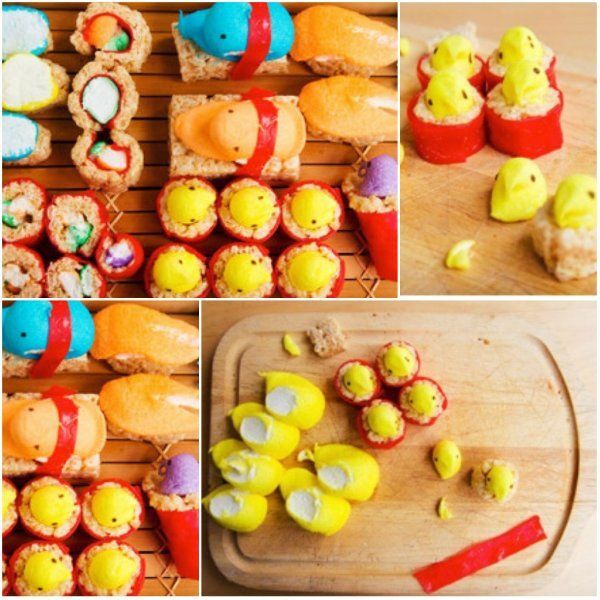 I haven't had rice krispies in forever and I love that the peeps head is cut off -- "peeps sushi" love it! And thanks for sharing. Have a fabulous weekend with your family. Oh my goodness I want to try this NOW! I love sushi! Peep Sushi? Even better! PS - thanks much for the book recommendation over on my blog, I'll be checking it out as soon as this semester comes to an end! My anime loving DD is up in arms for me to get her to the store for the last peeps of the season! She loves this! Thanks for sharing! They are too cute to eat, I think I would shellack them and keep them forever!